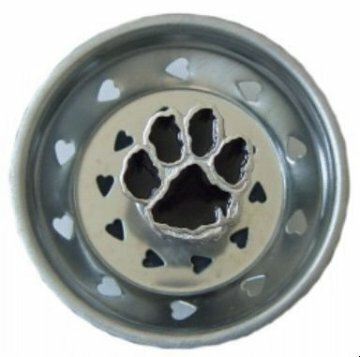 This fun decorative pawprint drain stopper is both fun and functional!! The stopper's handle is a sturdy pawprint and the straining holes are heart-shaped cutouts showing love for all things pawed. Like most kitchen sink stoppers, this one acts as a strainer to keep unwanted items out of the drain and also serves as a drain stopper in the side of the sink that allows you to fill the basin, but it is a lot cuter than the average sink stopper! For more information about the pawprint kitchen drain stopper, click here.